The chart above shows that over the first 25 months of the current recovery the unemployment rate has declined from 10.1% to 8.5% while the size of the labor force is virtually unchanged even though the working age population has grown. Since the beginning of 2008 the working age population has grown by 7.2 million people. Yet the labor force which is normally about two-thirds of the working age population has shrunk over the same period by 49,000. Thus, 4.8 million men and women who should be included in the unemployment rate calculation as both in the labor force and unemployed are not counted at all because they have become too discouraged to look for jobs. If those men and women were included in the unemployment rate calculation the December rate would have been 11.3%, higher than any time since 1940. 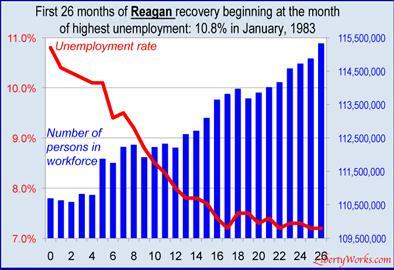 The second chart above tracks the first 25 months of the Reagan recovery of the 1980s. President Reagan inherited a sick economy and a deep recession that by most measures was worse than what President Obama inherited. As the chart shows, the unemployment rate soared even higher but then there was a steep drop even as the labor force grew by 4.3 million! People did not give up looking for jobs during the Reagan boom because there was robust growth in the economy and employers were creating hundreds of thousands of jobs every month. 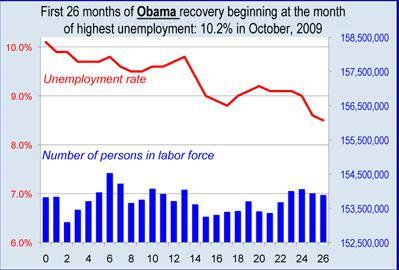 There is a potential downside that could blow up Obama’s propaganda campaign. If the “good news” about the unemployment rate encourages several million people to come back into the labor force and seek jobs, the number officially classified as “unemployed” will increase and the unemployment rate will tick back up as the November election approaches.